Grace Lagoner in action during a game this season. The Butler lacrosse team plays at Cincinnati on April 2. Jimmy Lafakis/Collegian file photo. After finishing 11th out of 15 teams at the Bobby Nichols Invitational in mid-March, the Butler men’s golf team will host its annual spring invitational on Monday and Tuesday at Highland Golf Club in Indianapolis. Last year’s event was cancelled due to weather. In 2017, the Bulldogs finished second out of three teams in the invitational. The team’s next action following the Butler Spring Invitational is the Big Four Classic, which takes place on April 9 in Carmel, Indiana. The men’s golf team will wrap up play in the Butler Spring Invitational at Highland Golf Club on Tuesday. 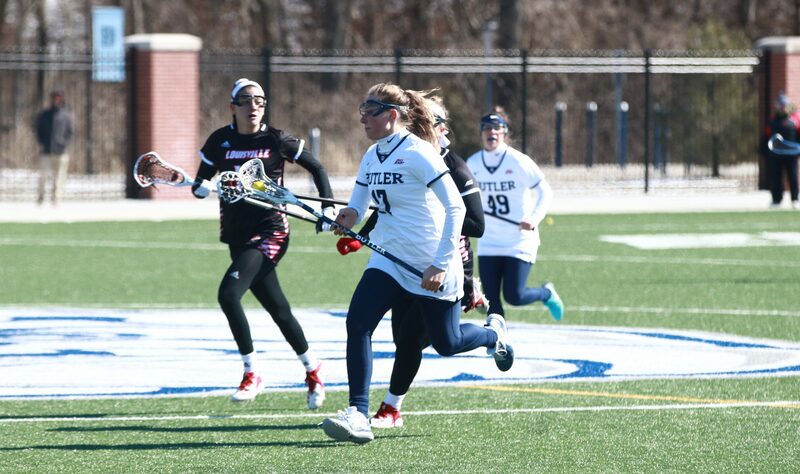 Following a 21-3 home loss to Georgetown in its first Big East contest of the season, the Butler lacrosse team will look for a better result when it travels to Cincinnati to take on the Bearcats on Tuesday. Cincinnati has won three straight matches and will enter with a 6-5 overall record following an 11-9 victory over UConn on March 30. Last season, the Bearcats defeated the Bulldogs 14-8 at Varsity Field in late April. Play will get underway at 12 p.m. at Gettler Stadium in Cincinnati. Over this past weekend, the Butler baseball team won its only game against Southern Illinois after the final two games of a three-game series were cancelled due to weather. On Tuesday, the Bulldogs will travel east for a midweek matchup against Dayton. The Flyers are coming off a 2-1 series against Massachusetts over the weekend and are now 13-12-1 on the season overall. These two teams last played each other in 2017, with the Bulldogs winning 4-0. First pitch from Dayton is slated for 3 p.m.
After winning 10 straight matches, the Butler men’s tennis team has now lost two of its last three contests, including a 4-1 loss at St. John’s in its most recent competition. The Bulldogs will look to get back in the win column with a mid-week matchup at Ball State. Last April, the Cardinals defeated the Bulldogs 4-3 in Muncie. Ball State is 10-10 this season following a 5-2 loss to NIU over this past weekend. First serve from Cardinal Creek Tennis Center is slated for 1 p.m.
With weather cancelling its three-game home series against Villanova over this past weekend, the Butler softball team will play in its first game in a week when it faces IUPUI on Wednesday afternoon. The Bulldogs defeated the Jaguars 8-0 in their first game of the season, back on Feb. 8 in Rosemont, Illinois. Jenna Foreman registered three hits and Kaitlin Doud had two RBI in the game. IUPUI enters the week with a 9-23 overall record, though this will be just its second true home game of the season. First pitch from the IUPUI Softball Complex is slated for 5 p.m. The men’s and women’s track teams return to action on Friday at the Gibson Invitational in Terre Haute, Indiana. The two teams competed at the Raleigh Relays in North Carolina this past weekend. Wade Walder won his section of the 110-meter hurdles with a personal-best time of 14.73, while Allie Vogeler won the 400-meter hurdles with a time of 59.22. Competition gets underway on Friday and lasts through Saturday. The men’s tennis team will continue Big East play on Friday with a home match against Xavier. The Musketeers have struggled to a 6-12 overall record this season, including a 1-6 road mark, though they do have wins in two of their last three matches. Last year, Butler shutout Xavier 7-0 on April 21 in its last regular season match of the season. First serve from Butler’s outdoor tennis courts is scheduled for 3 p.m. The baseball team will return to action following its mid-week contest with a three-game weekend series at home against St. John’s. The Red Storm are coming off a 2-0 series against St. Louis over this past weekend, and will face Saint Peters and Columbia on Tuesday and Wednesday, respectively, before traveling to Indianapolis. St. John’s is 12-10 overall on the season, including 7-0 on the road. Friday’s game will get underway at 4 p.m. at Bulldog Park and be broadcast on the Big East Digital Network. The men’s and women’s track teams will wrap up competition at the Gibson Invitational in Terre Haute, Indiana, on Saturday. The men’s tennis team will wrap up a three-match week with a contest against the University of Illinois at Chicago on Saturday. UIC has struggled mightily this year, posting just a 3-11 record thus far. The Flames are coming off a 5-2 win over Wright State this past Sunday. UIC is slated to play at IUPUI early in the day on Saturday before traveling to Butler’s campus to compete at the outdoor tennis courts. A start time has not been announced. The softball team will return to Big East play when it travels to New Jersey to take on Seton Hall in a three-game weekend series. Last year, the Bulldogs outscored the Pirates 14-6 in a three-game home series, taking two of three contests. Seton Hall is 12-15 and coming off an 8-6 loss to DePaul this past weekend. First pitch for the first game of Saturday’s doubleheader is slated for 12 p.m. The baseball team will continue its three-game weekend series against St. John’s with a home game at 2 p.m., streaming on the Butler Athletics Facebook page. The lacrosse team will play in its second road game of the week when it travels to Wisconsin to face Marquette in its second game of conference play. Last season, the Golden Eagles defeated the Bulldogs 19-3 at Varsity Field in early April. This season, Marquette owns a 6-7 record following losses to Central Michigan, Northwestern, and Villanova in its most recent contests. Play will get underway for this one at Valley Fields in Milwaukee at 5 p.m. The Butler women’s golf team will return to action for the first time in nearly three weeks when it travels to Terre Haute, Indiana, to participate in the Indiana State Invitational. The Bulldogs are coming off a 10th place finish out of 12 teams at the Bobby Nichols Invitational in mid-March. Previously, they finished first out of five teams at the Savannah State Spring Fling. Play gets underway on Sunday and lasts through Monday. The softball team will wrap up its three-game weekend series at Seton Hall with a 12 p.m. game in South Orange, New Jersey. The baseball team will wrap up its three-game series against St. John’s with a 1 p.m. game streaming on the Butler Athletics Facebook page.